.015 – They let you hold weapons? This past weekend the Florida Steampunk Exhibition East was held in Daytona Beach, Florida, which is only an hour or so away from me as the crow flies, so I had to go. I feel like I don’t spend enough time here talking about how much I love steampunk. I talk some about how I’m writing in the genre, but I don’t give it the same breathless space and time here as I do in other places around the internet. So just to catch you up to speed: I LOVE STEAMPUNK. I love it as a genre and an artform and a dress sense. I love the endless possibility and the optimistic daring do of the people involved and the characters that they write or portray. I’m just as fascinated with the darkly tinged not-so-nice-history parts of it as I am with the bright, shiny leather and brass parts. And as you might imagine, this all lays very neatly over my general appreciation for Wacky Victorians anyway, so it’s a perfect fit for a person such as myself who loves reading and writing in the science fiction genre. 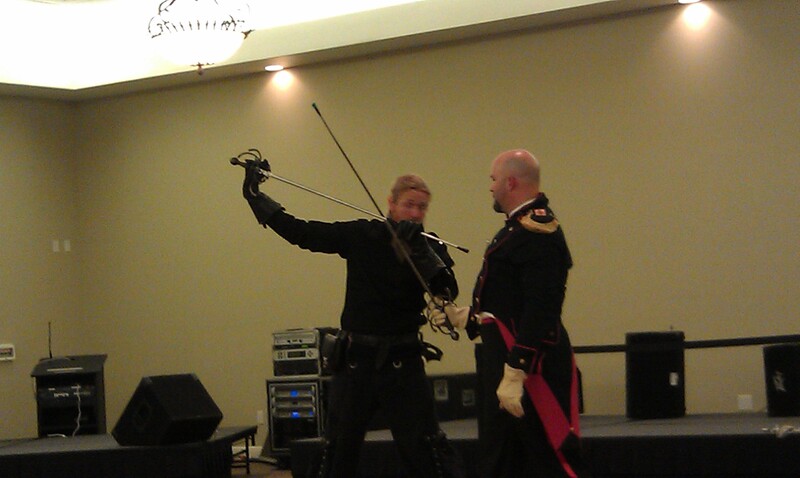 Even more specific to my urge to attend the convention than my love of steampunk in general, I had seen that there was going to be a three hour panel/class called Victorian Self-Defense. 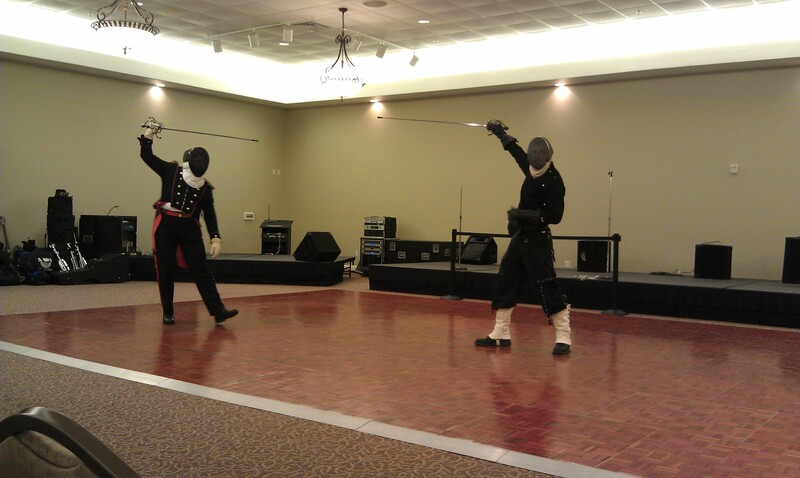 I had thought that it would be about bartitsu (which is an interesting subject in itself), so you can imagine my jaw dropping surprise when Alli and I showed up and found two gentlemen standing at the head of the room with rapiers. We both sat down and immediately began taking furious notes. Two of our characters are kind of swords-for-the-cause in employ of the main gentleman driving our revolution, and while I had done research into sword fighting with both fencing foils (and epees) and sabers, there is little internet or book research that can compare to having two people in front of you actually explaining things like footwork and posture and timing. We spent a good thirty minutes taking pictures and scribbling diagrams and whispering back and forth to each other about how cool this all was…and then the instructors* asked if anyone wanted some hands-on instruction. Alli jumped at the chance, and I followed. There were about seven to ten of us at the time. Each one of us was handed a bamboo rod shown how to stand and we were off. The two instructors would explain and demonstrate what they wanted us to do–things like forcing your opponent’s sword offline or giving and avoiding a beat–and then have each of us perform the action against them. The two gentlemen running the class were professional and patient and seemed to enjoy being able to have the interaction, and that made the whole thing all the more enjoyable for the rest of us. Then came the tipping point in Alli and my’s mutual giddiness about rapier instruction in general. 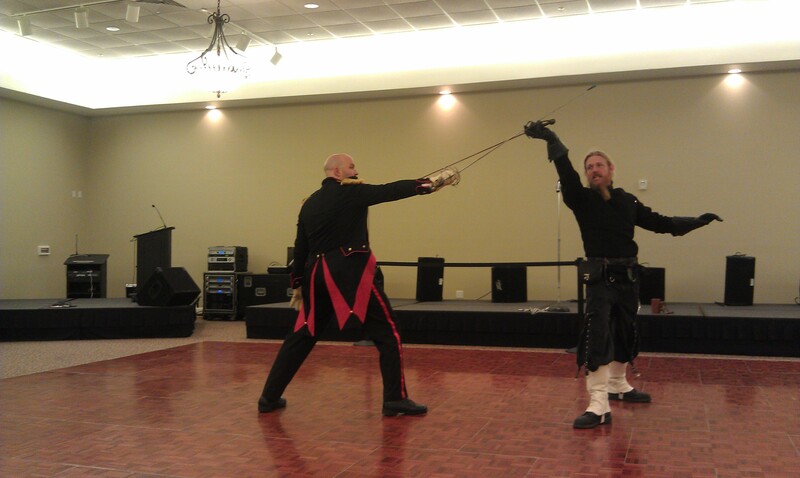 They acted out a throw and then had each one of us practice and perform it against one of them using the rapier. I know that logistically they had to give us the rapiers, because bamboo rods don’t have hilts with which to hold down another person’s blade, but I honestly felt a bit like I’d been handed Auryn** in that moment. The sword was a little heavier than I thought it would be and the basket fits around your hand in a way that makes you part of the sword and just. It was an awesome moment and I really want to thank the two of them for it, as well as the organizers of the event for inviting them and setting up an experience like that in the first place. We were still buzzing from the rush of it all when we got home in the evening, so right now we’re looking into fencing clubs here in Orlando. You never know, it could be a fun way to get in more exercise and learn a new skill. It is definitely a way to have a few more of All Of The Experiences and would give me even more things to blog about. Now for the informative part of the post! If you would like to learn more about steampunk, there have been a whole slew of excellent articles written, but Tor does a Steampunk Week that always has articles of interest for people who are new to the concept or find it all to be old hat. The links from 2011 can be found here. Chivalry Bookshelf – who publishes many out of print texts on all sorts of things, including swordplay. HEMA – The website for Historical European Martial Arts. The Western Martial Arts Coalition. And the works (if I can find them) of William Wilson, Achille Marozzo, Fiore dei Liberi, and George Silver. All of that should keep me and you guys busy for quite some time. Now I must away to work some more at our wonderful little steampunk world. It had been too long when I started in on it today and immediately fell in love with our characters all over again. Funny how that happens. And just appease the voice of Edmund in my head after all this talk of straight edges with points at the end, here’s my favorite of the sabers I’ve researched. 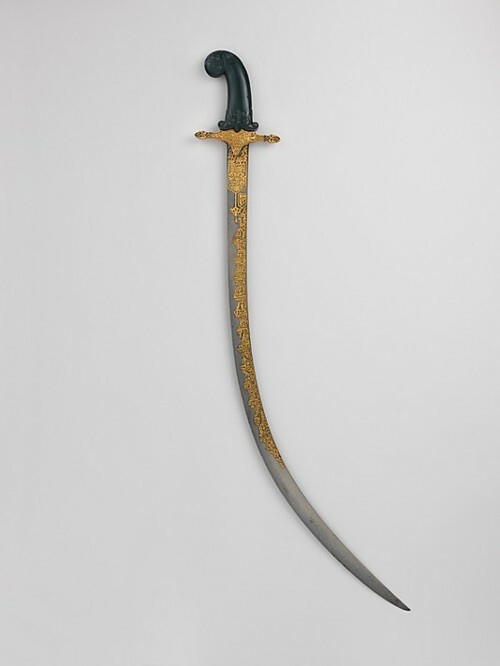 Turkish, 19th century, housed at The Metropolitan Museum of Art. * I didn’t catch their names! It’s not in the program or on the site or readily available in any search done by me in the last ten minutes! If anyone knows, please share so I can add them to the write up and also love them from afar. ** Auryn, for those of you not into 80s movies, is the serpent pendant from The Neverending Story that guides Atreyu on his quest. Before I launch into the recap of first quarter of relative failure I wanted to share the link to a short write up that Sierra Houk did about the Wrong Opinions About Movies Podcast that I am lucky enough to be on with my friend Matthew Bowers and my writing partner Alli Martin. It’s great fun for me to be able to discuss movies with my friends on the internet, but it’s even more fun if other people get in on the conversation. Today we recorded our Titanic episode and in the coming months we’ll be doing a whole slew of Batman episodes with special guests in preparation for The Dark Knight Rises. If you like movies and wrong opinions give us a listen! Flubs: That is a depressing number and I know it. I would feel bad about it, but most everyone I know also had a bad March, word-wise. Divided we blunder, together we procrastinate! March was a rough month in general mentally, which isn’t an excuse, but it is part of the problem. And now that I’ve rooted out where I am I can start to rebuild and get back to the important things. The writing things. Looking back at my Impossible 2012 Plan, this month I have failed at: completing Volunteer Vampires, finishing the rough of my parts of of The Steampunk, and submitting a second poem for publication. I haven’t started a second short story either, but I’ve decided I need to try and be less ADD about everything that directly affects the rest of my life. We’ll see how that goes. I will continue to be ADD in the day to day, though, lest you’re concerned I’ll stop derailing conversations with ridiculous non sequiturs. Worry not! Follow Throughs: But I DID start the second round edit of my friend’s manuscript and submit a poem for publication. In case you missed my yelping when I got the news, that poem was accepted! I will have a steampunk themed poem in the fall issue of a small online poetry zine–which I will link back to when it goes up–and I am very excited about it. The non-writing people around me don’t understand my excitement, because it’s not “really being published”, but I don’t expect them to. My writing friends understand and I feel personally like it’s a good start and a small victory in the war with myself, so I’m excited. I wrote a poem! People didn’t hate it! I now need to carry that ego boost into a forward momentum and see what other things I can churn out that people won’t hate. I am going to finish the draft of Volunteer Vampires THIS WEEK, even if it kills me. Alli knows where to submit it for me posthumously if I do die. 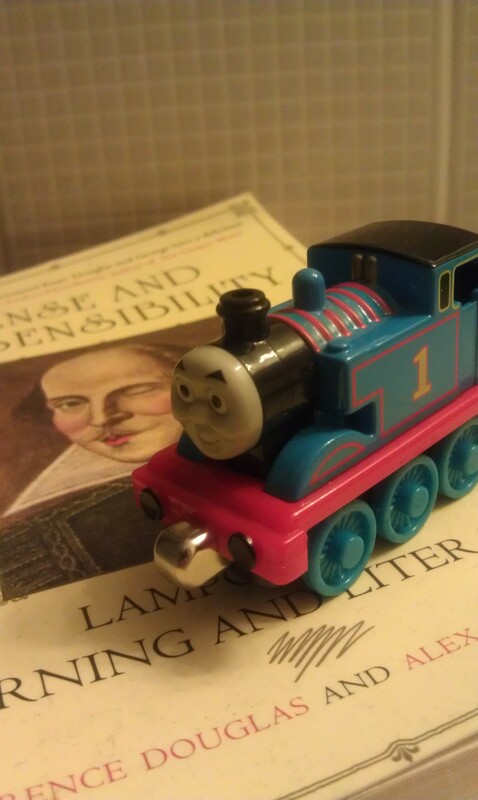 Barring that unfortunate possibility I am also going to write at least two more chapters of The Steampunk and edit half of my friend’s manuscript. I can do this. Deep breaths. One railway tie at a time. Or at least, that’s what I imagine my good luck hard work charm telling me.